We are delighted to be supporting the Yeovil Youth Theatre in their production of Grease, which will be on at the Octagon Theatre in Yeovil from 12th Nov – 16th Nov 2013. If you are looking for a great night out, tickets are available here – be there or be square! We’re getting ready for Christmas, not long to go now… only 50 days! Do you need a larger garage? A recent article by Honest John, a renowned and trusted car expert in the Daily Telegraph, argued that the width of garage doors in many new build homes is too small, to the point where they won’t even fit a typical mid-range saloon car! Fortunately the Door and Hardware Federation (DHF) have started a campaign to encourage housing developers to build homes with garages that are at least 7’6” wide, which is good news! New doors in our showroom! We’ve got lots of new and different garage doors in our showroom, with Secured by Design Up & Over Garage Doors and Sectional garage doors, GaraRoll roller doors, FrontGuard front entrance doors and accessories. If you are after a new door, pop in and have a look in our Yeovil showroom. Garador have just released their new range of remote hand transmitters… these Garador Series 3 handsets are available in either gloss black or gloss white. Click here to find your nearest stockist / order them on the Garador shop. Buying a garage door is not quite as simple as you might think. When you consider the range of colours, styles, types of door, gearing options, insulation options and the different brands on the market, where do you begin? The first thing homeowners should consider, when purchasing a garage door is what they want to use their garage for and where they live, and then look at how much they are willing to spend, whether they want an operator and issues such as water-tightness and insulation. All doors have their merits; sectional doors for example provide extra drive through width for your car, which is often taken up by the gearing mechanism on a traditional Up & Over canopy door. A sectional garage door also allows you to park your car right up close to the door, without fear of the door panel swinging out as it opens. If drive through width and space in front of the garage comes high on your list, but you don’t want tracks inside your garage then a roller door could be worth considering. These doors provide excellent insulation, rubber seals to prevent rain water coming in and come with the added convenience of being automated as standard. 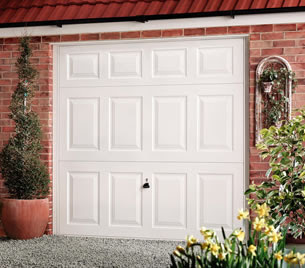 Budget is also an important consideration, the price of a Steel Up & Over door with canopy gearing is always the most cost-effective solution, but will always leave the bottom third of the door panel protruding out the front of the garage when open. Furthermore, whilst the option to buy a garage door with a steel frame, is an additional cost, it results in a much more professional finish with as little as a 6mm gap between the door and the frame, not to mention the fact that you save time and money not having to prepare and finish a timber frame when fitting the garage door. For buyers with concerns over the security of their garage, Garador have recently developed a Secured by Design accredited garage door range; the Guardian Range. Which have been rigorously tested by the UK police to prove they can withstand a serious attack from a burglar. Having an automated garage door not only provides added convenience, but also extra security as it always shuts the doors even if you are just popping down to the shops. The latest Garador range series 3 operator even comes with a remote sensing feature that tells you whether your door is open or closed, for those times when you just can’t see the door and you don’t want to venture outside on a wet winters night. So there are a range of different door styles on offer, to suit garages used to store everything from cars to home offices and more. There are budget options and more expensive ones, a selection of standard colours, and a broad range of door styles, to suit those with security concerns and even those who want a door to match an ultra-modern property. Click here to view the full range on the Garador website.